He will be 25 years old in a few weeks on April 26, but today 24-year-old Darnell Barrow continues to celebrate a victory whose significance he is still grappling with and growing to appreciate more and more. There are races, and there are races, on the cycling calendar in Belize, the USA, and the world. 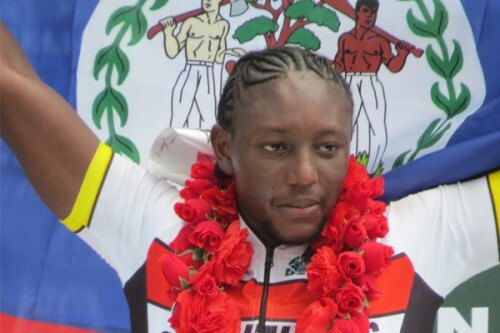 But with each passing year, the mystique and the glamour of the Belize Holy Saturday Cross Country Classic keeps growing with even greater cultural, historical and romantic allure, as one more rider gets his name added to that immortal list of Holy Saturday Cross Country Champions. In 15 years’ time, our Holy Saturday Cross Country Classic will be celebrating its own “centenary”; unbelievable. Indeed, as noted by Krem’s Eejay Hill, it is the oldest cycle race in the Western Hemisphere. That will be a huge milestone, and the race will surely be even bigger, as our population grows, as well as the world-wide fame and respect for this special historical and sporting tradition that has stood the test of time, and, like good wine, only keeps getting better. There were many big names being called coming up to Holy Saturday, as pundits gave their picks for the most likely champion in this year’s Cross Country. The foreigners are always strong contenders, with former Cross Country champions American Chris Harkey, Guatemalan Luis Santizo Lara, Mexican Carlos Lopez and American Scottie Weiss in the field. But the local favorites were overwhelmingly Marlon “Diesel” Castillo of Santino’s and Brandon Cattouse of C-Ray, with their respective team owners/managers, Santino Castillo and Ray Cattouse, Jr. making bold predictions. Other prominent local contenders were defending champion Geovanni Choto, 2006 champion Shane Vasquez, his younger brother Ron Vasquez, Byron Pope, Gregory Lovell, and Darnell Barrow, whom no one could discount due to his former 5th and 3rd place finishes. The knock on Darnell seems to have been that he was not considered a dedicated trainer, despite possessing great cycling potential. Team owner/manager Santino Castillo made the observation in a media interview, in defending his choice of Marlon Castillo as his team’s star going into Cross Country. For the Santino’s team, the script was already written; and it had fan favorite Marlon Castillo bringing home the garland. All the Santino’s team riders embarked on the historic Holy Saturday race with the game plan in mind. But there is always a “plan B,” and when, as fate would have it, Marlon suffered a serious spill near Belmopan on the return journey, team manager Santino said he made it clear to Darnell that he was now “the man” on whom their hopes rested. For his part, perennial Santino nemesis and C-Ray team owner Ray Cattouse, Jr. had made it known days before the race that his instruction to his two Mexican imports was simple, “You are riding for Brandon.” And so it was that when the race was at a critical point on the return journey, and C-Ray’s Mexican rider Luis Pulido Naranjo had a chance at running away with two other foreigners up front, he was instructed by Ray Cat to drop back and assist Brandon in the chase with the second group; which he did, and which changed the complexion of the race thereafter. Darnell did put in some work in preparation for the Country, along with teammate Quinton Hamilton. Just last Sunday, we observed him coming in shortly before the Junior Cross Country finishers at Leslie’s Imports; he had just returned from a ride to Rockville and back in the noon-day hot sun. They say that greatness is sometimes thrust upon one, but he/she has to be ready when the moment comes. In our chat behind the zinc fence this morning, Darnell said he wasn’t even sure in his mind that he would ride this year’s Cross Country after all; he had been toying with the idea of accompanying relatives to a trip elsewhere for the Easter. But the “Cross Country fever” may have gotten the best of him after all, as well as the obligation of supporting his team. When, on Good Friday night, he realized there was no egg in the house to prepare his usual morning breakfast of fried eggs before going to the race, it was already too late to purchase at the neighborhood grocers. So, on Holy Saturday morning, Darnell said he gobbled up some left over rice from the day before, and headed off to catch the beginning of the race, arriving just two minutes before the start, and suffering a penalty for not “signing in.” His name was officially entered on the starting list, but his team would suffer a signing penalty for his failure to arrive within the stipulated time to personally sign on the race register. In his haste to make it to the start, Darnell had not brought any water. Until Mile 30, when the first official servicing could be received, he had to rely on teammates and other riders for a mouthful of water from time to time from their riding bottles. Nevertheless, Darnell was there, he was in the Cross Country, infected with the aura and history of the event, unable to keep away, and prepared to do his duty as a support rider to his team’s accepted leader, Marlon Castillo. But fate had other plans for Darnell. With 87 riders starting at 6:00 a.m. from in front of Leslie’s Imports, this year’s Cross Country was ridden at a torrid pace, from the start to its finish in front of the Hour Bar and Grill just past the Fisheries compound on Princess Margaret Drive. And Darnell Barrow was there holding his own as the race progressed. There were a number of small breaks in the early part of the race, with none able to establish a significant lead before being reeled in by the main peloton. They were all together nearing Mile 41 where Santino’s Herman “Hijo” Requena won the station prize, but a few minutes later reports were that 4 cyclists had opened a near 1-minute lead over the main peloton; and that lead group included defending champion Geovanni Choto (Belikin/Western Spirit), former Junior rider Oscar Quiros, Jr. (Belikin/Western Spirit), Mexican Juan Pablo Magallanes (Benny’s) and Darnell Barrow (Santino’s). However, by the time they had passed the Belmopan cutoff, the picture had changed significantly, as two Mexican cyclists, Juan Pablo Magallanes (Benny’s) and Luis Pulido Naranjo (C-Ray) now held a 32-second lead on the main peloton. The duo led all the way into San Ignacio, and were not caught until around Mile 65 near Central Farm on the return journey, where a chase group of about 25 cyclists finally closed the gap. But about 10 minutes later there was another breakaway group of 4, including American Chris Harkey (Veloshine), Mexican Carlos Lopez (Benny’s), Mexican Luis Pulido Naranjo (C-Ray) and Guatemalan Alejandro Padilla Miranda (Santino’s). At the top of Mount Hope, the 4-man lead group had opened the gap above 1 minute, allowing service vehicles to approach them, and it was at this point that reports are that Ray Cat called on his Mexican rider Luis Pulido Naranjo to drop back and help Brandon in the chase. Chris Harkey was soon dropped, and with Pulido Naranjo gone, leaving only Carlos Lopez and Padilla Miranda remaining in the lead, the next 25 minutes saw a concerted effort from the chase group of 20 including Belizean hopefuls Brandon Cattouse (C-Ray) and Marlon Castillo (Santino’s) along with most of the top ranked cyclists – the Choto and Vasquez brothers of Belikin/Western Spirit, Byron Pope of Benny’s, Greg Lovell of Telemedia, and Darnell Barrow of Santino’s. With Pulido Naranjo doing much of the pacing for the chase group, the duo was eventually caught near Camalote, but the news also was received that a spill a few minutes earlier had resulted in Marlon Castillo leaving the race in an ambulance with a suspected broken collar bone. Other previous spills had reportedly also seen Dwight Lopez (Belcal) and Robert Liam Stewart (M&M) having to drop out of the race. Race experts have given the opinion that, had C-Ray’s Mexican import Luis Pulido Naranjo remained up front in combination with Benny’s Mexican Carlos Lopez and Santino’s Guatemalan Alejandro Padilla Miranda at that point, that formidable foreign trio could have kept, and perhaps opened their lead all the way to the finish. But C-Ray’s decisive action helped to bring back the race to give Brandon and other Belizeans, including Santino’s Darnell Barrow, a better chance. Coming out of Roaring Creek the peloton was back to about 25-30 riders, but soon there was another attempted break, as Peter Choto (Belikin/Western Spirit), American John Delong (Veloshine) and Gregory Lovell (Telemedia) opened a 25-second lead on the main peloton. There was a lot of jostling and lead changes among the members of the lead groups of cyclists, but when they passed the Rockville junction, there was another breakaway group of 3 out front, followed by a bunch of 4. The lead 3 were Guatemalan Alejandro Padilla Miranda of Santino’s, along with 2 Mexican riders from Benny’s, namely Juan Pablo Magallanes and Carlos Lopez. But by Mile 18 the lead bunch was reportedly back to 8. As we headed to the finish line on Princess Margaret Drive, we lost contact for a while with the radio reports, but the word going around was that some 20 riders were now in the lead bunch approaching Belize City. After the race, Santino’s Herman “Hijo” Requena said that the east wind became fresh in their faces as they neared Belize City, and the pace became really fierce as the peloton swung into Central American Boulevard, over the Belcan Bridge, around the roundabout, and on to Princess Margaret Drive. Citizens lined the street chanting and shouting support to their Belizean hopefuls as the cyclists raced by. A large crowd had gathered near the approach and on both sides of the finish line in front of the Hour Bar on Princess Margaret Drive, with radios turned loud as announcers heralded the approach of the lead peloton for what promised to be a dramatic sprint to the finish. When we made out the identities of the lead trio as the sprinting peloton neared the finish line, it was Mexican Juan Pablo Magallanes on the left and slightly in front, followed closely, but gaining, by Darnell Barrow on the right, and just behind them in the middle, American John Delong. The excited crowd was shouting and praying and cheering on the Belizean rider, Darnell Barrow, who was in good position among the front runners in the last 50 meters of the race. Shaking his bike a little as he dug down for everything he had left in the final 25 meters, Darnell produced one final burst of speed that convincingly overtook Magallanes, and raised his arms in triumph as he crossed the finish line clearly in front, to the explosive outburst of joy and celebration of ecstatic Belizean cycling fans. It was a wild scene after the spectacular Belizean victory, after it had seemed for a while that the foreigners would take it all. A lady fan, Ms. Sylvia Waight, produced a large Belizean flag and soon Darnell was practically carried onto the prepared press conference platform behind the wire fence where cameras of every description among the throng of adoring fans all had their chance to feast their eyes on the new champion draped in the Belizean flag and flanked by second place Mexican Juan Pablo Magallanes and third place American John Delong. After the race, we spoke briefly with a few of our other top Belizean riders, and to a man they all conceded that they were spent at the end of the race, and just didn’t have it at the finishing sprint. We did not get to speak with Belizean Justin Williams, who is based in Los Angeles, and who came in a strong 4th place in his first Holy Saturday Cross Country right behind John Delong. Were it a wind aided journey, there could well have been a new record on this Holy Saturday, which is the second fastest ever in 5:46:49. “Well, I’ll be darned.” While everyone had their eyes on Belizean favorites Marlon Castillo and Brandon Cattouse going into the race, along with the always dangerous foreigners, it was Darnell Barrow that Team Santino’s had to put all their hopes on after Marlon fell; and Darnell did it, adding his name forever to the illustrious list of Holy Saturday Cross Country Champions. And to think, he almost didn’t bother to participate this year. Congratulations to our new Holy Saturday Cross Country Champion, Darnell Barrow! Big up, Darnell! Our Cross Country Champion 2013!